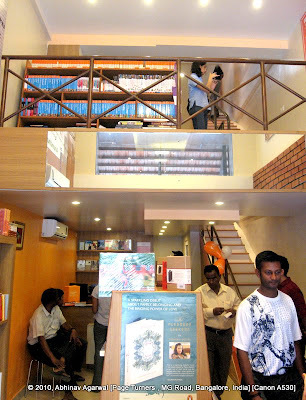 Page Turners - visited the latest bookstore in Bangalore this Sunday. It was in the news the past week because it was inaugurated by Narayan Murthy, co-founder of the Indian IT Services company, Infosys. The other notable thing is that it is Penguin Books' first collaborative retail store in India. It's on MG Road, in Kannan Center, adjacent to a GK Vale store. Spread across four floors and close to 2,500 sq. ft in M.G. Road’s Kannan Building, PageTurners is a great new collaboration between India’s premier publisher, Penguin Books India, and Surya Infotainment Products (SIP), the successor to the bookshop and magazine businesses of L.B. Publishers and Distributors Pvt Ltd, one of India’s oldest booksellers. Penguin Books has published over 50,000 titles, of which 15,000 are still in circulation. Page Turners stocks all the titles that are in circulation, and if you don’t find a book in the store, you can order it. Now, the one thing you will notice with the bookstore is that it is narrow. Yes - there is a rack on either wall, and there is one more rack in the middle on the floor, between the two walls. And barely enough space between the racks for a couple of people to stand without bumping into each other. The other thing is there are not too many seats, or chairs, or bean bags. So if you grab a book, you have to sort of keep standing while you leaf through the pages. They also have a loyalty program, where you get 10% off every book you buy. The cost of the program is Rs 250, and they will throw in a voucher worth Rs 250 you can use on your subsequent purchases. That's nice, but then I am thinking, I can go to online stores and get more than 10% off. Of course, it is not the same as browsing an aisle full of books, that you can simply pick off the shelf, flip the pages, read the blurbs on the jacket, and smell it. Yes - every book has a smell. And believe me, you can get a lot closer to books than you would have ever thought if you only spend a minute to stop and smell the books. That's an additional sensory trigger that gets you to make an association with the books you love.